These votive candle have two options¡ªtimer and constant on. So they are good for both daily use and events. If you use tealights everyday, you can use the timer function. With a built-in 5-hour on and 19-hour off timer, these tealights turn on and off automatically everyday. For an event or sometimes you want to use these tealights for more than 5 hours, you can use the constant on function. We have the unique battery saving technology so that our candles have very long battery life¡ª400 hours. This means you only need to replace batteries almost every 3 months, not 3 weeks. This technology will save you a lot of money on batteries. These environmental friendly flameless candles are ideal for home, hotel, restaurant, bar, spa and party decoration. Flameless candles are safe to use and there is no risk of fire. The tealights flicker like the real candles. The perfect size (1.5" in diameter and 2" in height) suits for most tealight candle holders in the market. And they can be used to decorate your vases, lanterns and etc. Unique Still-On technology to save energy consumption. Approx. 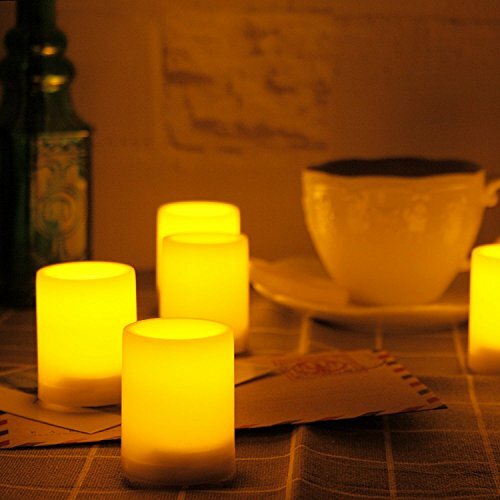 400 hours battery time, one of the longest battery life tea lights you can find in the market. EASY TO USE WITH TIMER: Build in 5-hour on/19-hour off timer. The tealights turn on and off automatically every day. If you have any questions about this product by Bnlingxian, contact us by completing and submitting the form below. If you are looking for a specif part number, please include it with your message.